Muncie Girls are streaming their cover of Iron Maiden’s The Wicker Man. The UK trio have released the cover ahead of their upcoming UK tour, which kicks off next month. The Wicker Man originally appeared on Iron Maiden’s 2000 album Brave New World. Muncie Girls recently released their Five Miles demo collection to raise money for The Cavern venue in their hometown of Exeter. The Cavern was ravaged by fire last month and needs extensive work carried out if it is to reopen. Vocalist and bassist Lande Hekt says: “Like so many other weird kids, we’ve been going there since we were 16 and we played our first shows there. 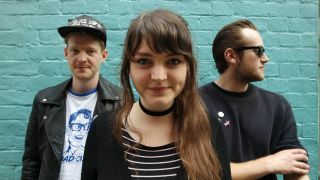 Muncie Girls released their debut album From Caplan To Belsize earlier this year.